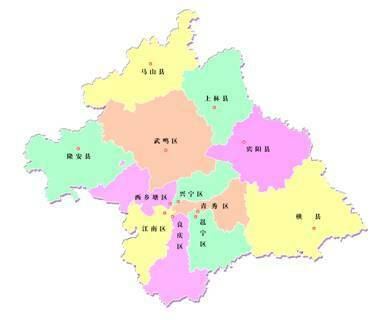 Nanning City now has jurisdiction over seven districts, including Xingning District, Jiangnan District, Qingxiu District, Xixiangtang District, Yongning District, Liangqing District and Wuming District; five counties, namely Hengxian County, Binyang County, Shanglin County, Mashan County and Long'an County, and three national development areas, including Nanning Hi-tech Zone, National Nanning Economic & Technological Development Area, Guangxi-ASEAN Economic & Technological Development Area. In recent years, Nanning has deepened its implementation of the urban development strategy which is to take Yongjiang River as an axis, build up the west side, expand to the east, perfect the north side and improve the south side of Yongjiang River, and transfer the core to the south. It has promoted the development and construction of Wuxiang New District, further stretched out the urban frames and intensified the radiation and driving force.